Blue roan is my favorite horse color. 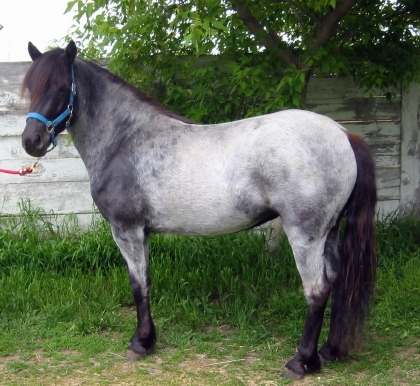 Genetically it is a roan pattern on top of a black base, although horses with a bay base color and roaning are also sometimes called blue roan. Blue roan is fairly unusual, but seems to be more common in Tennessee Walking Horses, some Quarter Horse lines (Foundation and Hancock breeding especially), some British pony breeds, and some French draft breeds. This picture is of a Newfoundland Pony mare, a rare Canadian breed derived from a mix of British pony breeds. The Newfoundland Pony Society has lots of pictures and information about these endangered ponies.